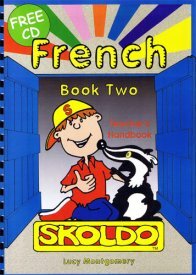 Skoldo French - Book Two is fun course for children aged 8 - 11 who have some knowledge of French already. There is ample support for non-specialist teachers of French and every effort has been made to ensure that teaching and learning French with Skoldo is a fun and rewarding experience. Requires little or not written work and is self-explanatory. It is easy, undemanding and ideal for a whole class working at the same speed. Requires more written work and a greater knowledge of language. It is ideal for the more able children who love a challenge. Requires little written skills as it is puzzle or maths based. It is ideal for homework or to extend conceptual development. The accompanying audio CD includes oral directions for activities and games as well as the songs. Karaoke versions of each track are included for class performances! Skoldo Book Two Teacher's Handbook is intended for use with 8 - 11 year olds who have studied some French already. It is intended to follow on from the other books in the Skoldo French course.